Recent events in Western Australia should have all of us gardeners quaking in our boots. 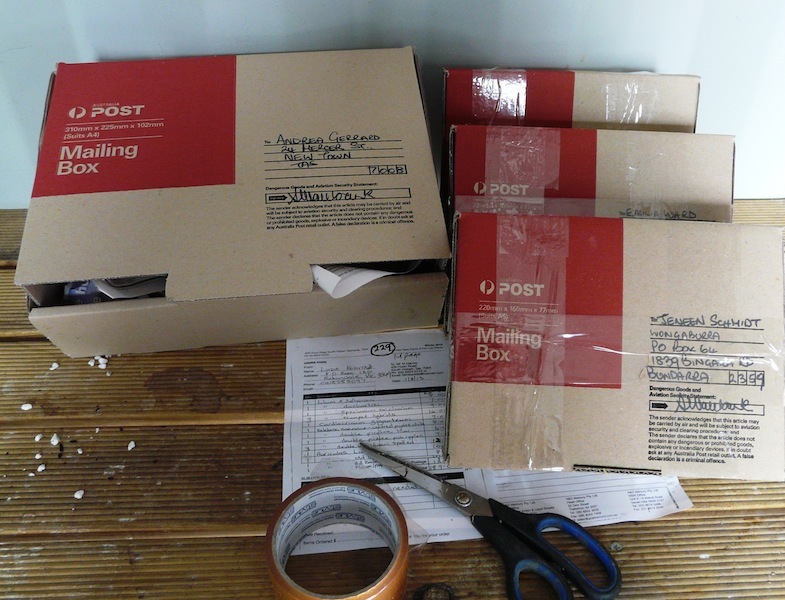 Since the first of July this year a $56 inspection fee will be imposed on home gardeners each and every time they purchase small numbers of certified plants or seeds through mail order suppliers from interstate. Not only is this situation monumentally unfair and short-sighted but it could also be the face of the future for all of us if we fail to heed the warning signs. Up until now most of us have taken it for granted that we have the right to make reasonable choices about how and with what we can garden as long we don’t stray outside the quarantine laws. We also believe that those from biosecurity viewed this right as legitimate and therefore subject to fair treatment. In an act of sheer arrogance (and a fair dose of ignorance) the West Australian Department of Food and Agriculture have thrown all that out the window, failing to consult the garden public on its intentions and failing to come up with a cogent answer as why they need to price gouge this group of amateur enthusiasts. Justifications so far range from the plain silly: they want to create a level playing field where both amateurs and businesses are treated equally .. huh?, to those of the motherhood variety: these fees are necessary in order to continue to protect WA’s biosecurity … this is a statement rather than an argument and WA is already a net benefactor with most of the costs already borne by the exporting states with WA adding nothing extra to the importation process. So far criticisms from garden groups, the nursery industry, permaculture practitioners and all manner of complainants have fallen on deaf ears with the only action from the department being to desperately try to find ways to cost shift these fees onto the exporters and the exporting states thereby blunting the local anger over their decision. This fee slug directly affects more than the gardeners. Its negative effects will be felt throughout the market, pushing prices higher, narrowing the range of plants available, causing the departure of independent specialist nurseries and generally impoverishing the entire trade, which will be increasingly dominated by a few very large players. Not that the department is in the least bit concerned about that. They would appear to want home gardeners completely out of the importation process because having to deal with them distracts effort away from their core business of looking after the agricultural industry and keeping onside with the environmental lobby. So for the Department it’s a simple win-win situation: they will get gardeners to pay or price them out. If this move succeeds in Western Australia, mark my words the other state biosecurity agencies will look at this with great interest. Our right to garden the way we want to will be under threat and I fear we gardeners just aren’t switched on enough to these issues to mount a defence. So here is a plea to all of you to think beyond your patch, become informed, and be ready to organize if and when the time comes to act. Don’t leave it to others and don’t think it won’t happen because when we hit the fence it will be too late. This fee charge leaps from zero to $56 with immediate effect, with no warning and no gradual introduction. This is massive slug (a 500% increase) on those who have no choice but to use the system. By point of comparison NO other state imposes a similar inspection fee on home gardeners. Even the Federal agency (DAFF),which has the central and far more complex task of defending Australia’s national borders, charges less for the same block of inspection time. Fails to discriminate between amateur gardeners and professional horticulturists. This fee applies equally to both amateur gardeners pursuing a hobby and professional horticulturists who are businessman. This is a grossly unfair situation. Professional horticulturists can achieve economies of scale by importing large volumes thus reducing the impact of the fee and they can also claim such costs as a tax deduction. The home gardener (whose purchases in most cases would not even exceed $56) can do neither and is left facing a very disproportionate impact. All plants imported into WA arise either from quality assurance schemes or have passed through quarantine protocols that the State proscribes. These processes were established to achieve efficiencies and high standard biosecurity outcomes. They are paid for by the exporters and the biosecurity agencies in those exporting states. It is therefore staggering that the WA’s Department of Agriculture and Food, which it already greatly benefits from this arrangement, seeks to extract a further massive fee from a system to which it contributes no additional services. Gardening is widely regarded as a social good. It is strongly correlated with positive health outcomes, community engagement and pro-environmental behavior. This recent price slug on gardeners is in effect a tax on positive community values and diminishes a powerful force for social good. Massive fee increases inevitably lead to price rises and a reduction in the range of products on offer to the market. Smaller specialists are forced out, consumers are compelled to purchase from a limited range of suppliers and oligopolistic behavior is favoured. In this scenario gardeners and the gardening market in WA are unjustifiably worse off when compared with any other Australian state and this raises the question of undue interference on free trade. This recent fee increase is at best, either a fund-raising exercise, or at worst, a “backdoor” deterrent. Whatever it is it appears have little to do with simple cost recovery. Perhaps if the department was more adequately funded then it would be less focused on itself and be more proactive in producing good policy outcomes for all of the stakeholders and not just the chosen few? Perhaps if it actively sought more internal efficiencies it would not have to gouge its clients? For example, what about abandoning the WA approved list, which is extraordinarily inefficient, and opt for the ready-made federally funded system with a locally determined prohibited list (as all the other states do)? Biosecurity benefits EVERYONE and the gardening community should not be made pay a disproportionate price to continue to pursue their interests. Their activities are miniscule in comparison to other stakeholders, like agribusiness and large-scale horticulture. I have heard that the department is entering into special arrangements with exporters in other states to reduce the impact. This is just another dreadful example of cost shifting onto a group who already pay most of the present costs associated with export to your state. These are bad decisions because they are highly unfair and inequitable. West Australian gardeners and the garden community should not be treated as cash cows. Nor should their right to fair treatment be completely ignored and as such be delegitimized. Are seed libraries illegal in some US states? Marcus Harvey is a well known Australian plant hunter, traveller and nurseryman. He holds extensive and important collections of a range of cool climate bulbs, including, crocus, fritillaria, cyclamen, calochortus and galanthus. He has travelled extensively in Greece and Turkey and the Balkans to view many of his subjects in the wild and has presented these journeys to audiences around the country. His nursery, Hill View Rare Plants is widely regarded as one of the very best of its kind and is often the “go to” site for the rarest of the rare. Thanks for the heads up. I wasn’t aware of this and whilst I am all for protecting the biodiversity of WA and Aust as a whole, this does seem very odd. You have prompted me to go and find out more about it. Yes, does seem somewhat of an overkill move. Is it a WA thing? It reminds me that when we arrived at Perth airport from the east coast early this year and I was disposing of a half-eaten apple I had in my hand luggage, an officious and unnecessarily rude official in the arrival hall commented quite harshly on how I was threatening their biosecurity….. and could be fined heavily. Nice welcome!!! I am not sure what you mean by, “Is it a WA thing? Do you mean does this fee extend beyond WA or that WA is over officious about biosecurity? Marcus, I was pondering whether WA was overly officious about biosecurity. You are quite right, gardeners rights are being eroded there and this new legislation seems v ill-founded. What policy advisers/makers are at work in WA, I wonder? The main point to make though is that a major disconnect has developed between what gardeners do and what governments and business do. And it is becoming increasingly apparent that gardeners are not considered legitimate stakeholders and are becoming increasingly marginalized. This is partly because we gardeners are not organized around a common goal of optimizing our self interest or defending it. As a result our interests, our activities and our opinions are “below the radar” to those who have other powerful agendas. Sadly gardeners run a very poor second to more sharply focused groups like organic farming and permaculture. This situation has arisen is because “the market” determines all. All of us are now regarded as passive consumers rather than active participants. If you don’t have a business number or a lobby group you don’t have a right. Hmm, it could be time we gardeners grew some (t)horns! Horns? A bit of courage to take these issues on would be terrific. Its time to get serious about our interests and not leave the field open to bureaucratic abuse and powerful (and antagonistic) vested interests. No-one is arguing for NO biosecurity – we want equitable and meaningful biosecurity. In reference to WA: There is no direct biosecurity benefit to the state from the impost of this fee. The revenue take is negligible once all the exporters who cant make special arrangements are driven out of the trade and those with special arrangements pay a pittance. And those who import seeds from interstate only need to have them sent offshore and then reposted back into Australia to avoid the fee. And why is WA demanding such a massive fee for the simple clearance of legally permitted products that have ALREADY been inspected, treated and certified in the exporting state. These products are already at the lowest end of risk and that risk cannot be meaningfully improved by a WA clearance procedure! You beat me to the punch but I’m glad you have pointed out the iniquity of what is going on and it isn’t the only thing being done by those who profess to be protecting us and the environment as I pointed out in my article on weeds. I will visit some of the other inappropriate rules and regulations in my next diatribe. Do you think that we may see a militant gardeners movement? You ask if,”we may see a militant gardeners movement?” What Australian gardeners need to realise is that they are not considered legitimate stakeholders and will become increasingly marginalized. We need to get organized around our common self interest and get about defending it. Otherwise the following two examples of wilful WA bureaucratic arrogance will become commonplace. How is it possible to say that charging home gardeners levels the playing field when under the new arrangements a commercial importer importing 1000 plants is paying the same the same fee as a home gardener who imports just 1? The home gardener is 1000 times worse off AND the businessman can claim the fee as a tax deduction. Also Mr Pickles’ description of a home gardener as a “private risk creator” is nonsense. 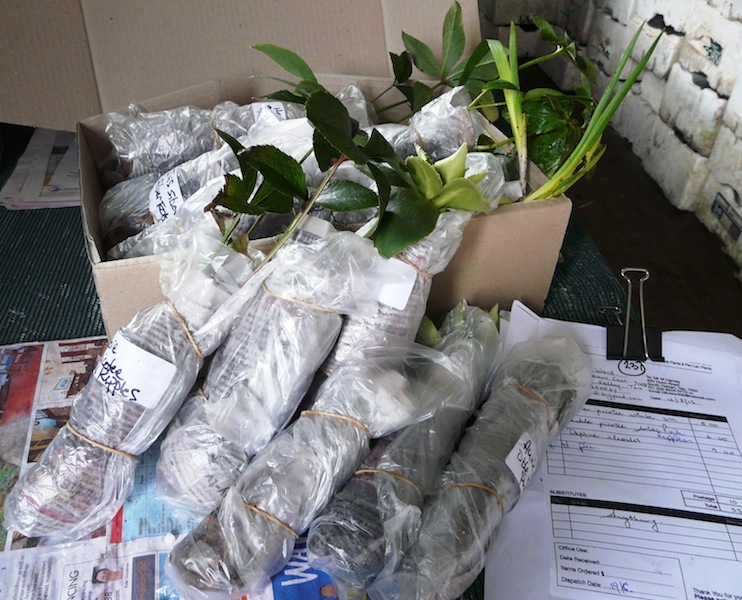 All plants entering WA legally have been already inspected and treated in the exporting state. They are already as risk-free as they will get. All WA is doing is extracting a further $56 from the process. PS Mr Pickles statement that, “the Biosecurity and Agriculture Management Act 2007 (BAM Act) doesn’t differentiate or discriminate between commercial and private risk creators.” is erroneous because for the past 6 years the Department has MOST DEFINITELY made a differentiation between commercial and private interests. I suspect that sole reason why this has changed is that it is no longer in the Department’s INTERESTS to do so. Interesting, we knew about the process and the fee back in May. Hence, we did an article about it in Issue 31 of the subTropical Gardening magazine. Can you tell me how you found out that early? I am from interstate and I am relying on what my customers are telling me and what online searches reveal. The earliest Departmental release I can find is June 25th and all the online discussion about this matter that I can see starts at the beginning of July. In fact most of my customers didn’t even know that these changes had taken place. Can you provide a link to your magazine’s article? Is this “Law” to protect W.A. from the introduction of noxious weeds from other States….an indigenous plant from another state can become a huge problem elsewhere…. You need to read my article. This is an issue about fees – its not about laws. WA already has a substantial suite of laws that protect its biosecurity … including its indigenous plants and biodiversity. The question being asked here is: Is it fair and equitable to ask home gardeners to pay an equivalent fee to that of a commercial operator when this fee is $56 per 15 minutes? 1.Commercial operations are hundreds of times better off than home gardeners under these arrangements. 2. Home gardeners represent a miniscule proportion of the import trade and therefore an insignificant demand on Departmental resources and a piddling source of revenue. 3. All plants legally entering WA have been already certified and treated by the exporter at their expense. In most cases the WA quarantine officer only needs to sight this certification and for that WA is demanding an additional $56. 4. 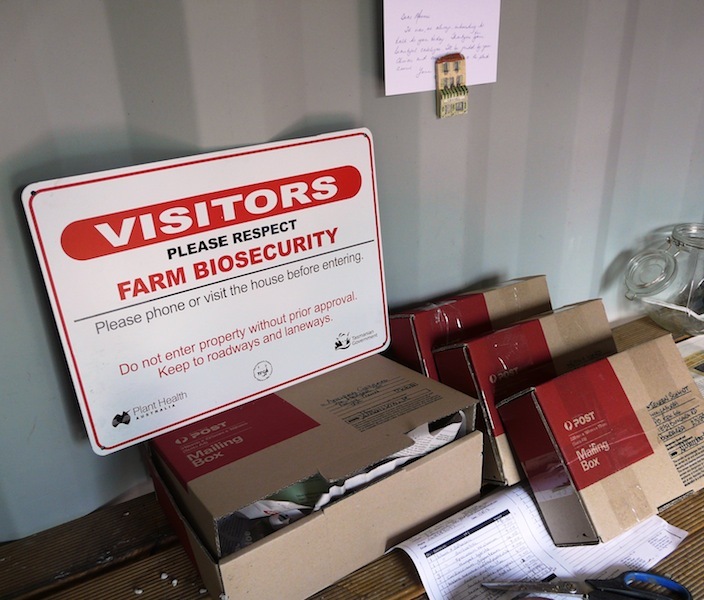 Biosecurity is everybody’s responsibility and everyone benefits from it so instead of gouging a vulnerable group of home gardeners the Department needs to be looking to increase the fee on commercial operators or getting a better deal from budgetary allocations. 5. Gardening brings a substantial benefit to the community and fees like this one are a negative tax on community wellbeing. I see an opportunity here for an enterprising shipping company, to do one shipment of plants per week, for many east coast mail order companies to WA. 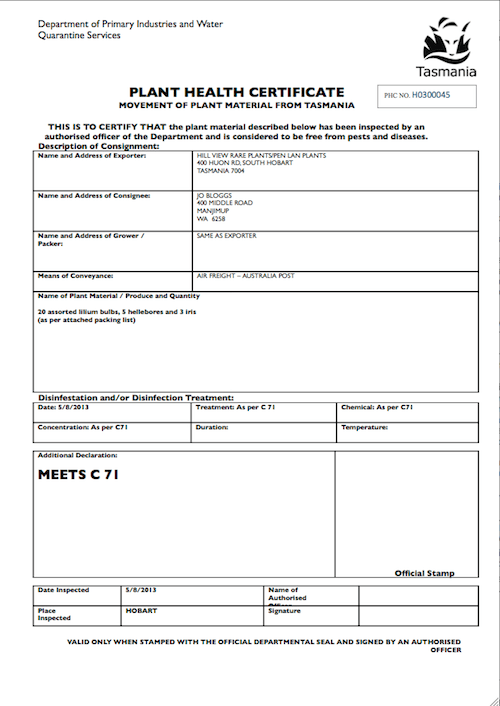 One Phyto and health certificate Etc. Then post the boxes individually from WA. Only one shipment payment to the Government. There are warehousing and mail companies in WA that could do this. If I was in the mail order plant business I certainly would. Yes there are ways and means around these things. But the point I am hammering home here is that WA is adding nothing new to an already established process and is looking to extract another $56 every time someone passes GO. So the Department is clawing money out of the system in which it is ALREADY a net benefactor. And such behaviour could be subject to legal challenge. Here’s the thing: $56 dollars for a 15 minute inspection = $224 an hour. The quarantine officer “delivering” this inspection service will have educational levels of HSC or less and they will be paid around 60k per annum. This works out at around $29 per hour. No additional processes, equipment or training is required when dealing with amateur home gardeners because it is already established for commercial importers. Home gardener importers represent no greater risk than they did before they were required to pay the $56 fee. Then why should home gardeners expected to pay $200 an hour above the rate based on simple cost recovery ($29). The Department looks to be gouging fees well in excess of what is reasonable and looks to be engaged in practises that disrupt free trade between the states. Both of these issues should be looked at as possible legal challenges. Agree with what you say. Legal changes would be expensive and at the high court level. Simpler to by pass them all together, by making their expensive unfair law, work for the people. But it would need someone to do it, and be the importer and re-shipping agent. I will mention it to people who do our plants via mail order. Thanks for your follow up comments. You are right of course about the free trade case. Even if this has merit the State knows it can get away with it (except when they get the Commonwealth’s nose out of joint). But I am not so sure about the matter of grossly over-charging. This could be looked at by the state equivalent of the ACCC or at least by the State Ombudsman. Anyway my intention is primarily to raise awareness and to try to stimulate some debate and hopefully get some leadership happening amongst gardening circles. Most of the mainstream media personalities appear to be wilfully autistic about this issue (whatever happened to the champions of free speech?). The garden club community appears disinterested, or maybe feels impotent, and the general gardening public bemused and possibly cowered by a heavy-handed administration. My main aim is to get the wider Australian gardening community awake to these matters. The world has changed and gardeners don’t seem to understand this. Their rights are under fire and they need to step up and defend them. A more politically aware and active body is required that can lobby respective levels of government. If not then we will remain, to use my own earlier quote, “just another group of passive consumers”. This new practice by the Western Australian Government is very difficult to interpret as other an a callous grab for additional revenue at the expense of amateur gardeners who have no capacity to offset the charges. In all the public information available from the Department of Food and Agriculture, I can find no information on the increased level of quarantine scrutiny that will result from the new charges. It therefore seems to me that there are important questions which need to be asked by Western Australian gardeners. Were the WA quarantine procedures in place before the introduction of the new charges inadequate to protect WA’s natural environment from incursions by unwelcome plants grown by Australian gardeners? Now that additional funds are available, what are the details of the additional scrutiny that will ensure greater security of WA natural environment from the ravages of garden plants? Unless WA gardeners can get satisfactory answers to these questions, they can be forgiven for assuming that their government is practising some perverse form of horticultural voyeurism – YOU pay and WE’LL look! I have to admit that my prime concern is the possibility of other states and territories adopting similar practices and, in particular, my own state of Tasmania. My personal experiences in importing plant material from interstate is that the current process is relatively painless and the additional charges which result from vendors meeting quality assurance procedures on their practices as well as ensuring bio-security on their product is not overly onerous – currently. I have monitored the Tasmanian Department of Primary Industries, Parks, Water and the Environment information on quarantine for a number of years and I have yet to hear of new incursions into Tasmania of unwanted plants. Similarly, in importing seeds from overseas countries, as long as I adhere to the requirements of the ICON database information on approved seed, I have no difficulties. The system seems to work here. Responsible gardeners and responsible horticultural vendors want to adhere to sensible quarantine practices. It is in ALL our interests. And it ensures our joy in gardening. The nub of the issue seems to be that those who adhere to government regulation are being required to pay unreasonable fees in WA while those who circumvent the system will continue to go undetected. Or perhaps the WA Government will have an automatic detector to find 10 seeds in interstate letter!! Thank you for your thoughtful comments. You make several good points, especially in the last paragraph where you ask: Does this fee result in more illegal detections or just more paper shuffling with a very large cost to those who chose to legally import? But how can this fee can be a viable source of cost recovery when large companies like Diggers and Tesselaar will be the ONLY ones left in the market and they have special arrangements which effectively negate the Department’s ability to recover costs? i.e. They will be able to have a large number of their orders cleared by WA Quarantine for just ONE charge of $56. That doesn’t appear to be a very effective revenue raiser. The Department is charging an excessive fee for the simple clearance of a permitted, legal product which has ALREADY met all the proscribed quarantine entry criteria of inspection, treatment and certification. I believe this is price gouging and the Department is operating illegally in doing so. Placing costly, restrictive regulations on exporters of legal products and then providing special arrangements that less wealthy exporters cannot afford to implement is anti competitive. This is ESPECIALLY so when the purpose of the regulation as a cost recovery toll is ineffective anyway. Any gardening lawyers out there or anyone who has thought about this matter your opinions would be very welcome.